Chick Pea-split and de husked. 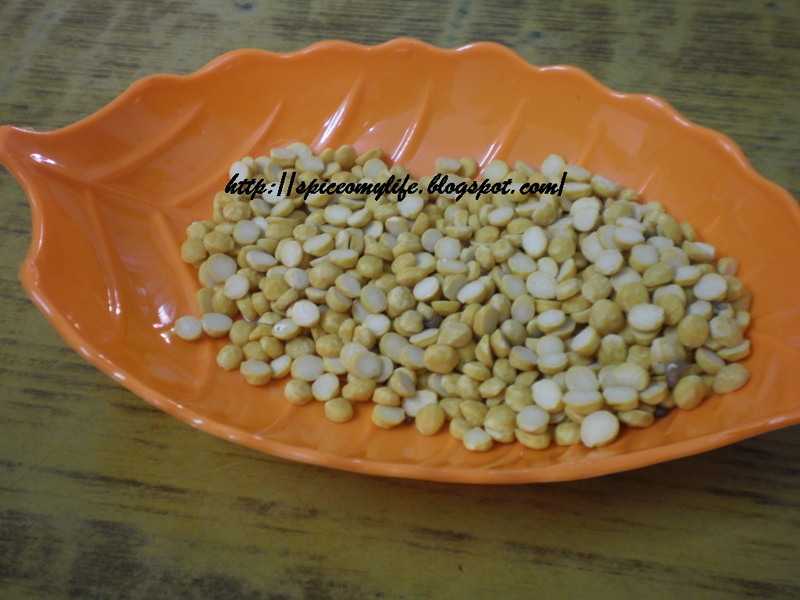 Chick Pea is also known as Bengal Gram. It is very tasty, nutritious and good for health. But excessive in take will cause indigestion. This chutney will be good with cooked rice or any fried snacks. 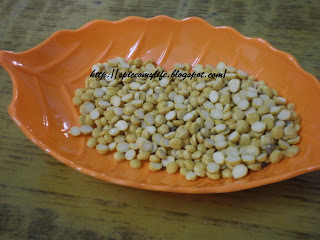 For the recipes given below use split and cleaned (de husked) gram which is known as Chana Dal (चना दल) in Hindi and Senaga Pappu (శనగ పప్పు) in Telugu, which looks as in the picture above. Take lentil, tamarind pulp, jaggery, salt and red chillies and grind to a paste adding water little at a time. The paste should be a little coarse and very thick. To make it more tastier- Heat oil to smoking point,lower the heat, add fenugreek seeds, mustard seeds, black gram and fry for two minutes, then add cumin, let them splutter, add asafoetida and curry leaves. Add this to the chutney mix well and serve. Garnish with coriander greens. Serve with rice or snacks. Adjust the quantity of chillies according to your preference, as it will be very spicy. Add 2-3 pods of garlic(sliced) to the chutney after frying it in oil along with the tempering or separately. It can also be ground (after frying) along with the ingredients of chutney. Wash and soak the lentil in enough (two to three cups) water for 2-3 hours till well soaked. Drain the water and keep aside. Take lentil, jaggery, salt, lemon juice, ginger and green chillies and grind to a paste adding little water if necessary. Actually since it is soaked, it does not require additional water. Heat oil to a smoking point, lower the heat, add fenugreek seeds, mustard seeds fry for a minute or two. Add cumin, asafoetida, curry leaves and pieces of red chili. After they start spluttering, remove from fire, add to the chutney paste and mix well. Garnish with finely chopped coriander greens and serve. Adjust the quantity of chillies according to your taste if you are using, both green and red chillies. The above quantity will make it very spicy. You can add garlic raw or fried sliced or ground to paste.